McPartland Inducted into National Radio Hall of Fame Congratulations to Marian McPartland on her induction into the National Radio Hall of Fame. Since 1978 the English born jazz musician has hosted one of the longest running weekly programs on NPR — Piano Jazz. Hear an audio montage produced for the awards ceremony. 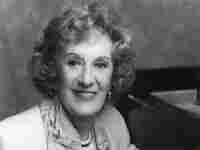 Congratulations to Marian McPartland on her induction into the National Radio Hall of Fame. You can listen to the two-minute audio montage produced for the awards ceremony on this page. Host of Marian McPartland's Piano Jazz for more than 25 years on National Public Radio, McPartland taught herself how to play piano at age three. Since 1978 the English born jazz musician has hosted one of the longest running weekly programs on NPR. McPartland is revered for her own talent and welcomes a wide range of guests to her program, including legendary jazz artists and fledgling jazz talents.